Use a toothbrush with a small amount of toothpaste. Use circular, vibrating motions around the gumline for about 10 seconds on each tooth. Brush the lower teeth up and the upper teeth down. Also brush your tongue and the roof of your mouth. 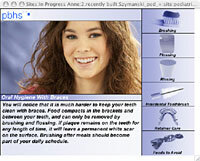 Floss nightly after brushing to remove the plaque missed by brushing. Carefully pull waxed floss between wire and braces. Floss carefully around the braces. Floss carefully around the gum area.